The controversial and elusive street artist, Banksy, has dismantled the exhibits and shuttered the gates of the “bemusement park” called “Dismaland.” Now the intention is to ship the materials to the Calais refugee camp in France to be used for building shelters. The camp, with more than 5,000 refugees, has been dubbed “the jungle” because of its lack of resources and overall dire conditions. 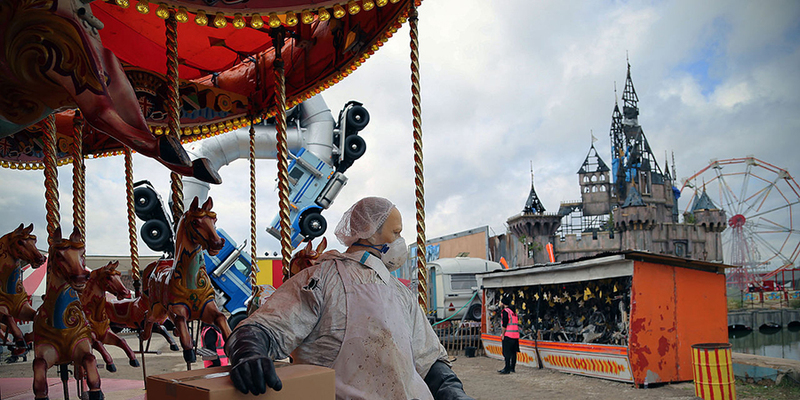 Dismaland was a collection of exhibits by a cadre of artists depicting a dystopian parody of smiley-faced theme parks. Set in England’s Somerset seaside, with a shuttered former public pool as the backdrop, the exhibition brought to mind a frightening future reminiscent of the Planet of the Apes movies. Cinderella’s gray castle was a dilapidated relic of a better day. The pumpkin coach lay upside down in pieces, with the deceased Cinderella tattered in the rubble. The gruesome display even came complete with gawking paparazzi snapping photos for the tabloids. There was an Orca killer whale (Free Willy?) emerging from the waters of a toilet to jump through a hoop into an inflated kiddie pool. And, a boatload of refugees floated aimlessly in a body of water, hoping for a welcoming hand on almost any shore. Banksy has gotten flack from both left and right. Some say the grotesquely graphic depictions go too far at blaming greedy capitalism for the world’s social and environmental ills. Banksy says, “Why should children be immune from the idea that to maintain our standard of living other children have to die trapped in the hulls of boats in the bottom of the Mediterranean? The grown-ups might have convinced themselves small incremental change and buying organic tomatoes is enough, but passing that mindset on to the next generation doesn’t feel like good parenting.” (Should children have to worry about adult concerns? I do recall being told to consider starving children in the world when refusing to eat my peas.) Yet, others have admonished Banksy for selling out to commercialization. 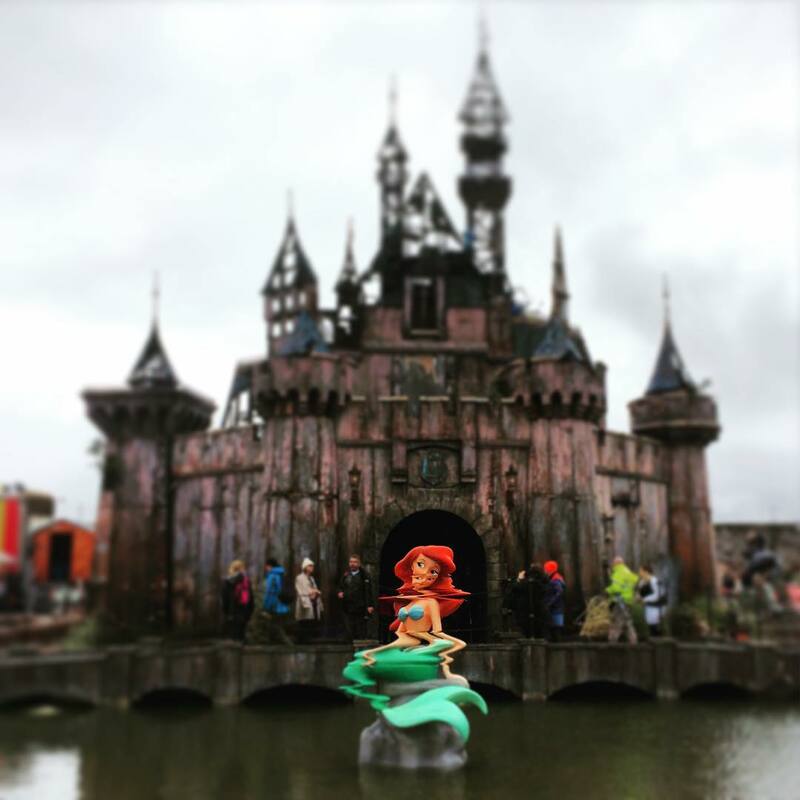 But, the intention for Dismaland was to draw people out of comfort zones and into harsh realities. Now, Banksy hopes that “Dismalaid” will continue to draw attention to and start a conversation about the global refugee crisis. So, according to the Dismaland Facebook page, the lumber and hardware have morphed into a few small structures to date to provide a locked space for families while they await a more enduring spot to call home. Whether this contribution will make a dent in the refugee housing problem at Calais or just turn out to be an energy consuming, artistic recycling fantasy is yet to be determined. But, since Banksy’s art is all about making a thought provoking statement, maybe it can claim success in that regard no matter what else does or doesn’t come of it.